The island of Giudecca is not a sestiere, I know, but its separateness and unique character make it deserving of its own page I think. 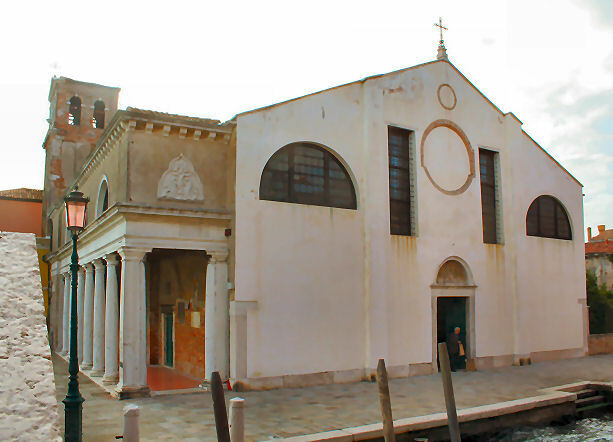 Officially it's part of the sestiere of Dorsoduro and the church of San Giorgio Maggiore is part of the sestiere of San Marco. 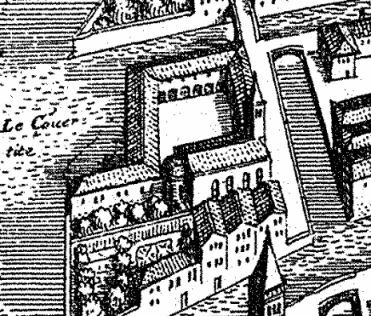 A convent founded in houses between 1530 and 1534, not until 1542-48 did the Augustinian sisters move to purpose-built premises, part of a complex including a convent and a hospice for reformed prostitutes and other sexually 'tainted' women. Restoration work on the church later in the same century was paid for by the merchant Bartolomeo Bontempelli. 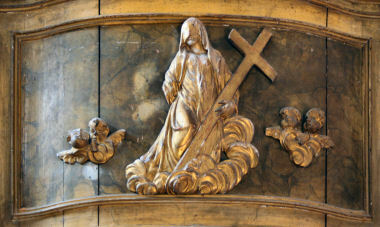 Originally named for Mary Magdalene it became known as Le Convertite to reflect its role in converting 'fallen' women. The institution soon became notorious, however, due to its rector Fra Giovanni Pietro Leon using the 400 nuns as his personal harem. He would 'test' the women when they came to confess by fondling them during confession - if they resisted he would congratulate them on their resisting temptation. And then imprison and punish them until they gave in. He was denounced to the Council of Ten in 1561 and beheaded in Piazza San Marco. It took 13 attempts with the axe, evidently, before his head was removed with a knife. This was seen as evidence that beheading was deemed by God as too light a punishment for a man so wicked. and his remains were burned. Suppressed by the French in 1806, the complex became a hospital before the Austrians made it into a jail in 1857. It is still a women's prison, the entrance is under the flag to the right of the façade in the photo. On Thursday mornings organic fruit and vegetables grown by the inmates in the prison gardens are sold from a stall in front of the church. Visible on the Merian map (see right). In an episode of a 2010 Jamie Oliver cookery series Jamie does Venice he visits the prison, to pick vegetables from the gardens and cook minestrone soup for some suitably surly inmates. Fiorenza Corner and Teodosia Scripiana built a church and hermitage dedicated to Santa Maria degli Angeli, which was given to Fra Bonaventura degli Emmanueli and his Capuchins in 1541. They were expelled five years later by the heretic Fra Bernadino Ochino, finding refuge in the nearby (now lost) monastery of Sant'Angelo, and then returning here in 1548 when the monastery was destroyed and the heretic expelled. A new church was commissioned from Palladio by the Republic to commemorate the end of the 1575/7 plague (which killed 50,000 people but which was not as bad as the one of 1630-31 which took 46,000 people, 30% of Venice’s population, and which resulted in the building of the Salute). The church of the Redentore (Redeemer) was built for ceremony, on the site of the church of San Jacopo. The first stone was laid on May 3rd 1577, with consecration taking place on September 27th 1592. The project had been supervised by Antonio Da Ponte, the proto of the Salt Office. Palladio had died in 1580. The church was assigned to the Capuchin Order, who built a new monastery next door. Palladio's original design was for a centrally-planned church like the Pantheon, but this was rejected for being too pagan. What was eventually built is more longitudinal and reckoned to be Palladio's finest church. The high and wide staircase and the huge doorway are designed for processions and the church is made to be seen from afar - the best view being from the Zattare opposite. The attached monastery later became a barracks. The Festival of the Redentore, giving thanks for the end of the plague, continues. Every year on the third Sunday in July a bridge on barges is built from the Zattere so that Venetians can make the pilgrimage previously lead by the Doge and the Signoria. The festival is also famous for the fireworks the night before. The high and wide (15 step) stairway leads up to a façade which reflects the interior - the central three bays under the large pediment echo the nave, with the wings representing the depth of the side chapels. In the niches either side of the single entrance are statues of Saint Mark and Saint Francis. On top of the facade are Faith and two angels, with Saint Anthony of Padua and Saint Laurence Giustiniani flanking them lower down. A lead-covered wooden statue of The Redeemer is on top of the dome's lantern. All very Franciscan in the choice of subjects. An unusually uncluttered interior, mostly because of the church belonging to Capuchin monks, a very reformed branch of the Franciscan Order, who agreed to take it on providing their observance of vows of poverty was respected. So, no extravagance, no remunerative funerary masses and monuments, and one elegantly unembellished interior. Monumental, high, pale and airy (due to the many thermal windows) and very Palladian. The wide and aisleless nave has a barrel vault and three connected barrel-vaulted chapels on each side. Over the chancel there's a balustraded dome, and there are two chapels off of it which contain no altars and were built so that the Doge and Signoria could sit unobserved by the common herd. The friar's choir, with its undecorated wooden stalls, is behind a curved screen of columns behind the high altar. It lacks the grandeur of the nave, and indeed of Palladio's choir in San Giorgio Maggiore, due to the Capuchin's more austere values. There's some middling art (the two Tintorettos are 'school of' and the 'school of' Veronese looks very like a Tintoretto) so even a more glowing Palma Giovane Deposition stands out a bit. The Veronese Baptism of Christ was commissioned for the Stravazino chapel in 1561, during the artist's lifetime but finished and signed by his brother Benedetto and the studio. In fact the altarpieces in all six nave chapels (the other two are by Francesco Bassano) have a unifying dark Tintoretto aspect to them. These chapels tell the Life of Christ, in an anti-clockwise direction, from birth to ascension, with a Crucifix over the high altar. This Crucifix, by Gerolamo Campagna, is flanked over the altar by statues of Saint Mark and Saint Francis, symbolising the partnership between the state and the Capuchins. They are by the same sculptor. The not-often-open sacristy, unmentioned on the Chorus info sheet and barely mentioned on the church's own leaflet, is a definite highlight. It is accessed through the last chapel in the nave on the right. A lot of paintings mostly of the Madonna and Child, including one I especially liked by Rocco Marconi, another by Alvise Vivarini, another Palma Giovane, and a Baptism by Veronese. Also lots of reliquaries and twelve creepy 18th-century wax heads of Franciscan saints under glass domes, complete with real hair and Murano-glass eyes. In 1618 a Capuchine friar, Paolo Piazza (Padre Cosmo da Castelfranco) was commissioned to paint a series of monochrome grisaille figures, in imitation of sculpture, for niches in the nave. These were of Prophets, Sibyls, The Four Evangelists and The Four Latin Doctors of the Church. In 1640 The Twelve Apostles by another friar Padre Massimo da Verona, where created for the drum. All have now been dispersed, but are visible in a photo from before 1950, see right. Francesco Bissolo, a pupil of Giovanni Bellini, painted Christ exchanging the crown of thorns for a crown of gold with Saint Catherine for the Redentore, but it is now in the Accademia. Il Redentore, an oil painting by Duncan Grant, 1948. 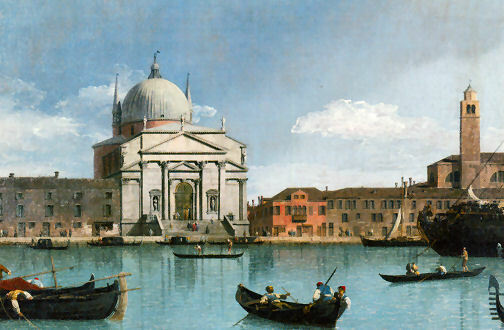 The Church of the Redentore by Canaletto (see above) from the Manchester Art Gallery. 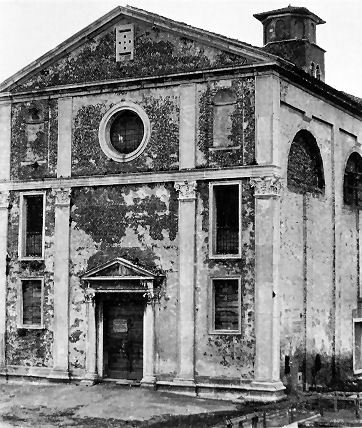 The demolished church of San Giacomo della Giudecca is visible to the right. 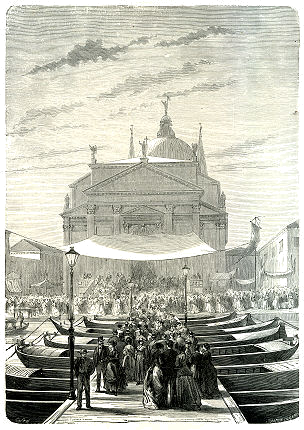 The Depositing of John Bellini's Three Pictures in the Church of the Redentore, Venice by J.M.W. Turner shows the three Bellini paintings arriving in splendid procession in gondolas. This almost definitely never happened, especially as the paintings in question, which were also mentioned in George Eliot's Journals in 1864 and William Dean Howells' Venetian Life of 1866 (see below) and by Ruskin, have since been reattributed to Bellini-pupil Francesco Bissolo and to Alvise Vivarini. It contains three interesting John Bellinis, and also, in the sacristy, a most beautiful Paul Veronese. Giudecca produces a variety of beggar, the most truculent and tenacious in all Venice, and it has a convent of lazy Capuchin friars who are likewise beggars. To them belongs the church of the Redentore, which only the Madonnas of Bellini in the sacristy make worthy to be seen. demolished to build the Redentore. 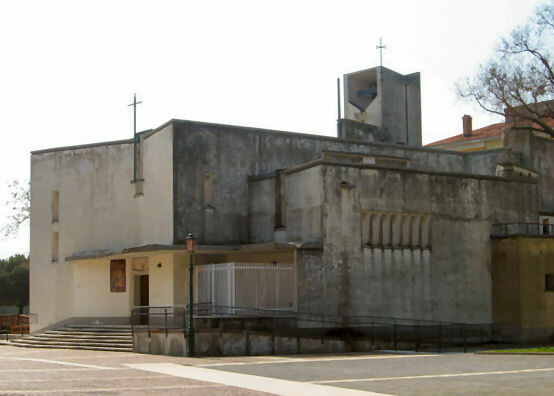 This is a brutally modern concrete church built from 1961 to plans by Renato Renosto amongst the modern flats on the Sacca Fisola to provide a church for the then-new residents. Inside are murals painted by Casaril and works by E. Costantini. It is named after the Venetian-born Dominican bishop who sailed from San Giorgio Maggiore to convert the Hungarians in 1020. His duties there included the education of Saint Emeric of Hungary, the son of Saint Stephen of Hungary. He was martyred in Budapest on a hill now named after him. It is said that he was placed on a 2-wheel cart, hauled to the top of the hill and rolled down, but still being alive at the bottom he was beaten to death. Other versions say he was put in a spiked barrel before being rolled down the hill. He was canonized in 1083, along with Saints Stephen and Emeric, and is one of the patron saints of Hungary. 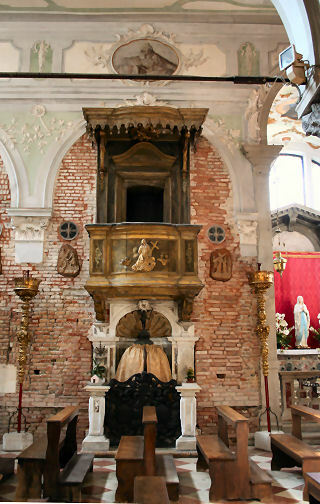 Some of his remains were translated to Santi Maria e Donato on Murano in 1333 and the urn is brought to San Giorgio Maggiore on every hundredth anniversary of his departure from that church to spend a night there. Founded in 865 and initially dedicated to four female saints - Euphemia, Dorothy, Tecla and Erasma, but as time passed the first saint's name came to dominate. The church became known colloquially as Famia and was renovated in 952. Reconsecrated in 1371 after rebuilding and renovated in the second half of the 16th century and again in the mid-18th, when it acquired new altars and the stucco decoration to the interior on the upper walls and ceiling. The portico along the side (visible in the photo right) is by Michele Sanmicheli and was donated by Giovanni Stucky in 1883. It dates from 1596 and was actually designed as the choir of the church of Santi Biagio e Cataldo, which was demolished to make way for the Stucky mill (now a swanky hotel) nearby. The 14th century Crucifixion above the main door comes from this demolished church too. Retains its Veneto-Byzantine form despite later restorations and decoration, with some columns and capitals dating from the 11th century. A surprising interior which has an old shell below, with old columns, that contrasts strongly with the flouncy rococo decoration above - all white, pale green and gilt. This effect is accentuated by the plaster on the lower part of the walls having been mostly chipped away to reveal the rough brickwork. The paintings around the chancel are uninspiring works by some followers of Veronese. Ceiling frescoes by Giambattista Canal, a follower of Tiepolo. The art highlight is Saint Roch and the Angel by Bartolomeo Vivarini (originally the central panel of a triptych which also featured Saint Sebastian and Saint Louis) with a lunette above of The Virgin and Child, both restored in 2008. There's also a Morleiter statue of The Pieta, where the body of Christ rests on a rock rather than in the usual maternal lap. This church's factsheet tells us that The Adoration of the Magi by Marieschi is 'no longer in place'. The current tower dates from the mid-18th century, restored in 1883. A drawing by Canaletto of around 1730 shows it once had a taller one with a sugar-loaf spire. As does a detail from a map of 1635 (right). The church and convent were founded in the 13th century, it is said, with the first documented mention in 1322. 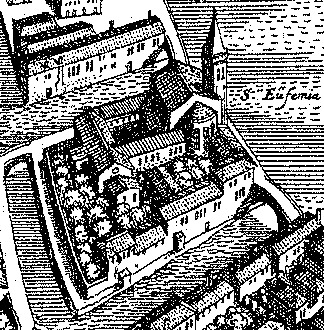 Eufamia Giustiniani, an abbess here from 1440 to 1487 and was made a saint in 1465. She was also the niece of Lorenzo Giustiniani, the bishop of San Pietro di Castello and later the first patriarch of Venice. While she was abbess only four nuns died in the plague of 1446 and a knight who turned up at the door and asked for water was later identified as having been Saint Sebastian himself, so the well here was renamed after him and the waters were said to have miraculous powers. Prosperity and growth lead to the the church being rebuilt 1508-11, with a façade in the Tuscan style by an architect going by the name of Maestro Pellegrini. This is the church we see today. The church and convent were suppressed in 1806 with the nuns moving to San Zaccaria and the complex becoming a prison. I have also read that it was later used by an old people's home. Quite recently restored, it is currently being used for storage by the Venetian public records office. Visible on the Merian map of 1635 (see below). 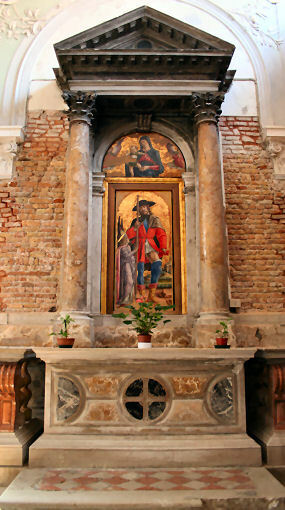 S. Antonio da Padova, S. Eliodoro and S. Filippo Neri by Antonio Zanchi now in San Pietro Martire on Murano, supposedly. Ceiling photo by Agnes Exenschläger. 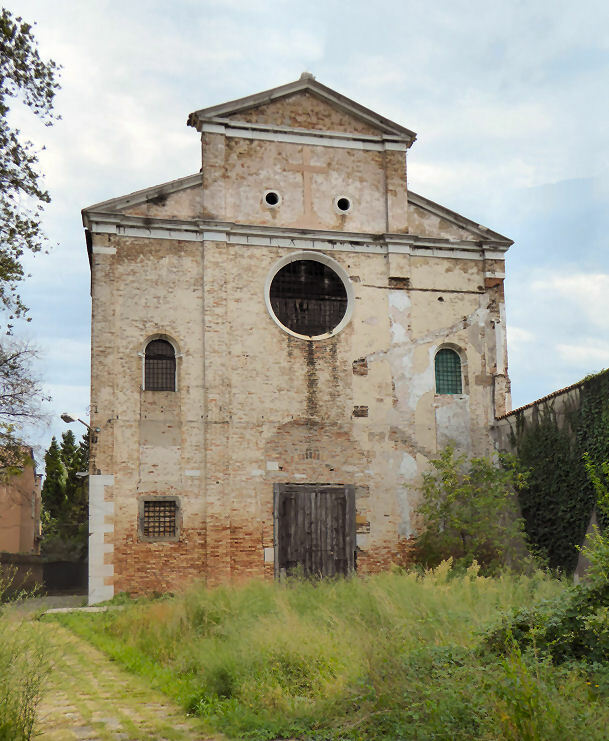 A convent was established here in 1481 by a Benedictine nun called Marina Celsi, who had been abbess at San Matteo on Murano and of Sant'Eufamia on Mazzorbo. The first stone was laid in 1491, with work completed in 1498. Consecrated in 1583, it is said that Mauro Codussi may have had a hand in the design of the church, he having been working at the time on San Michele in Isola and San Zaccaria, also for Benedictines. 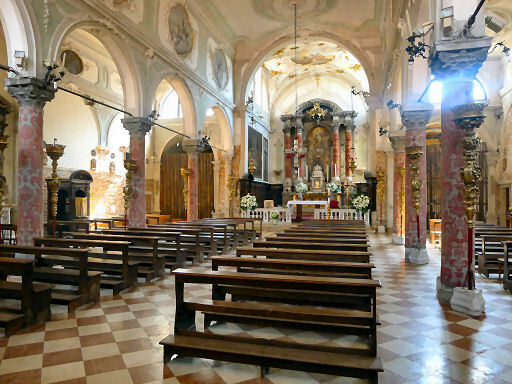 Upon suppression by Napoleon in 1806 the nuns moved to San Zaccaria. The church was stripped and became a warehouse, a barracks, and in 1887 a hospice for cholera victims. Sold in 1897 to the Herion Brothers who converted it into a textile factory (see interior photo below left), which it remained until the 1970s. The church was restored quite recently for use as an enterprise centre offering office space to small businesses, the convent buildings having been long since converted to housing. A fresco in the dome of the chancel of The Virgin with Female Saints by Girolamo Pellegrini is supposedly still in place. Giambattista Tiepolo's Punishment of the Serpent now in the Accademia - the long thin painting in Room 11 that was left rolled up for 60 years (and boy does it look it!) - was originally displayed under the choir at the back of this church. It was one of a cycle of paintings filling the church in the 17th and 18th century and eliciting much contemporary praise. Charles de Brosses praised many of the paintings and Coronelli in his 1744 guide said 'Here can be seen very many Paintings all by famous Artists, and these paintings deserve to be seen'. These included four paintings by Zanchi and one by Antonio Molinari, long lost. Also three by Sebastiano Ricci - Solomon Speaking to the People at the Dedication of the Temple, now in the Duomo in Thiene, Moses striking water from the Rock at Horeb, now in the Cini Foundation, and The Transportation of the Holy Ark, now in the Brera. Thematically the works are all Old Testament concentrations on the threats to the ancient Hebrews, which chimed nicely with contemporary worries about the upsurge of threats to the Venetian state. Giovanni Buonconsiglio's Saints Benedict, Tecla and Cosma, now in the Accademia is part of an altarpiece partially destroyed, perhaps by fire, here in 1740/41. The church housed the Tintoretto Madonna and Child with Saints, originally on the first altar on the left, also now to be found in the Accademia, and a Crucifixion by him. Also works by Palma Giovane, Buonconsiglio, Marascalco, and Padovanino. The church still has its spire on the Merian map of 1635 (see right). Once used by the military, later as a hostel for the homeless. Currently being used as studio space by an art foundation. The church appears in Giudecca, a watercolour by John Singer Sargent. Venice a watercolour view by Clara Montalba in the Walker Art Gallery in Liverpool features this church's singular campanile. A card bought from the Lo Verso shop on Giudecca in 2015 is, I think, the view of this church and its campanile from in front of Le Convertite (see right). A photo taken whilst the church was in use as a textile factory. That's the upper part of the chancel and two side chapels in the background. windows, including the lunettes down the side. The church of Santa Maria della Presentazione is better known as Le Zitelle, or The Spinsters, since here was a hospice for 'beautiful girls' from poor families whose beauty was thought to put them in danger of falling into prostitution. A prevention regime, than, as opposed to the nearby Convertite's concentration on helping already-fallen women. Poor young virgins were taken in, some as young as 12, and trained in lace and music making. They were kept protected until they were 18, when they could choose between marriage or the nunnery. If they chose marriage a husband was found and a dowry was provided. 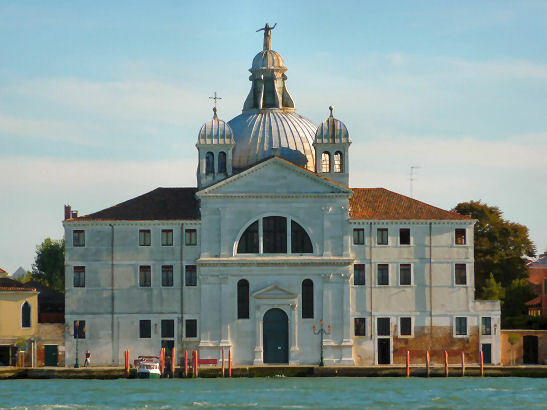 The convent was founded by the Jesuit Benedetto Palmio in 1558 and patronised by Venetian noblewomen. 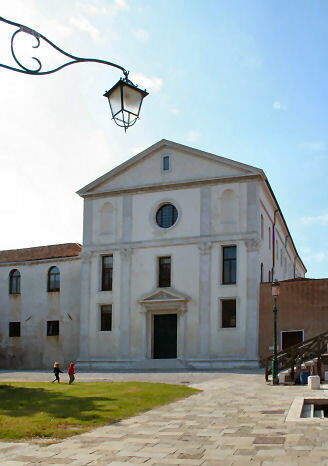 Following expansion of the accommodation in the mid-1560s the church, arguably based on designs by Palladio of around 1576 for a different church, was built by Jacopo Bozzetto from 1581-88. The Palladian façade is flanked by the wings of the convent. The buildings extend around the back and the cloister is behind the church. The convent is now a luxury hotel. A small barrel-vaulted vestibule leads to a square nave. The choir galleries were reached from the flanking convent buildings. There are works here by Palma Giovane, and Francesco Bassano, one of the four sons of the better known Jacopo. The Giudecca with the Zitelle by Franceso Guardi, in the National Gallery in London. Another version (see above right) is to be found in the Kunsthaus Zurich. but you have to book in advance.